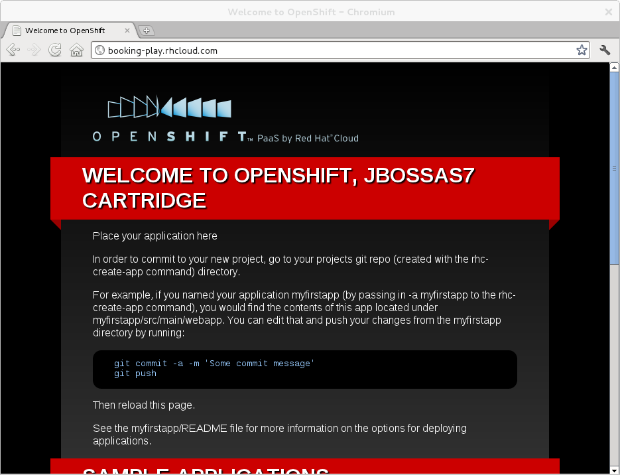 In a previous blog post, I showed how to run a Play application into JBoss AS 7. This time since JBoss AS7 is now available on OpenShift Express we are going to deploy that exact same application on this free offering. For this blog and related video, I'm using Linux (Fedora 15) and Play 1.2.2. The tools are also available for Mac and Windows. We'll assume that you already have Play configured as in the previous post. You will need an OpenShift Express account if you do not have one already, you can subscribe here. During the sign up process you will be led to a page explaining how to install the Red Hat Cloud tools. You can also find a video about installing the tools on an RPM-based Linux distribution here. The video at the bottom of this page will assume that the environment is already setup. The first thing to do with a new account is to create a domain. A domain can contain multiple apps. Your identification has been saved in /home/theute/.ssh/libra_id_rsa. Your public key has been saved in /home/theute/.ssh/libra_id_rsa.pub. in /home/theute/.openshift/express.conf which has been created and populated for you. The domain has been successfully created ! Note: From now on, the default user will be theute@redhat.com and I won't need to specify it in the subsequent commands. Now that the domain exist, we will want to create a new application, taking the JBoss AS 7 cartridge. To do so we will need to give it a name and specify the type of cartridge. Found a bug? Post to the forum and we'll get right on it. 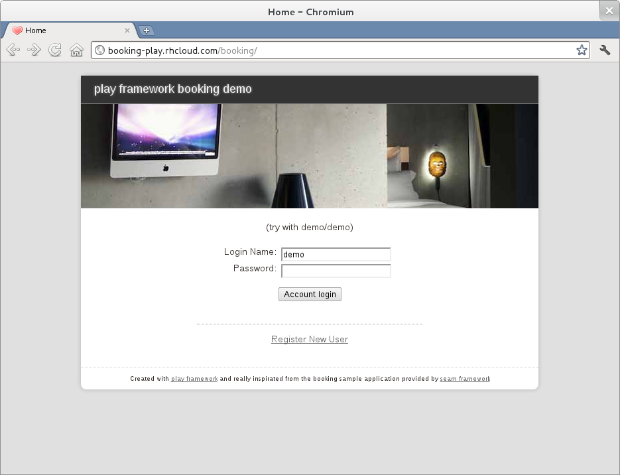 Warning: Permanently added 'booking-play.rhcloud.com,67.202.44.44' (RSA) to the list of known hosts. To make changes to your application, commit to booking/. To measure your progress you can go to the URL mentionned (http://booking-play.rhcloud.com/ in my case) to see your first AS7 application running on OpenShift in action. Now that we have this application up and running, we can now deploy our Play application (the booking demo). All the deployment is done using GIT. You will need to know a little bit about git, but the main commands will be used here (how to commit and push the changes). During the application creation, the command also clone the GIT repository locally in a folder named as your application (booking in our example). The pom.xml file and src directory is a Maven project, it's actually the webapplication that is shown on the screenshot above. Since our booking project isn't a Maven project, we will push a web archive directly and we will not need the pom.xml and src directory. git commit -m "Removing useless application"
Now similarly to what we've done in the previous blog entry, we will want to create a war from the booking play application. git commit -m "Adding Play Application"
The last command will take some time the first time as the play application embeds a lot of (unused) libraries (25MB of files in total to upload). Next push would be much faster. Compressing objects: 100% (199/199), done. Writing objects: 100% (213/213), 25.62 MiB | 51 KiB/s, done. Next in the serie will be how to use MySQL as storage instead of H2 in memory (as currently setup).